With spring fast approaching here's a guide to the essential lawn care for the season ahead. The essential tasks: The immediate effect of the essential tasks such as mowing, watering, feeding and weeding is to keep the lawn looking attractive, but there is also a vital long-term effect. The vigour of the desirable grasses is maintained and increased so that unwelcome invaders such as weeds, moss and some diseases find it harder to gain a foothold. 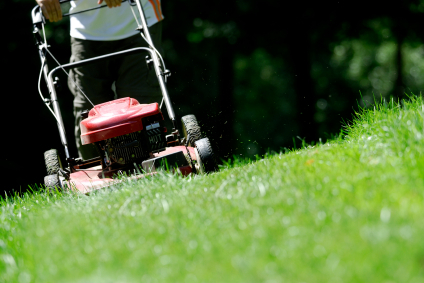 Mow regularly: The number one essential task is correct mowing. This means beginning and ending at the proper time with the blades set at the correct height. Blades must be sharp and properly set. Water before the lawn turns brown: The first effect of drought is a loss of springiness and a general dullness of the turf. Look for these signs after about 7 days of dry weather during the summer. Water copiously; a light sprinkling every day can do more harm than good. Trim the edges: A lawn with overgrown grass at the edges can be an eyesore. Make sure the mower can reach right up to the edge then trim around the edges. Make sure edging tools are sharp.Feed with nitrogen-rich fertiliser in spring or early summer: The constant cropping of the grass foliage is a serious drain on the nutrient reserves in the soil, so a routine feed is essential at the early part of the growing season. Rake during the spring and again in the autumn: Raking the lawn with a spring-tine rake has several benefits. The build-up of thatch is prevented and surface debris is removed. The removal of fallen leaves in autumn is essential - never leave them on the lawn surface over winter. Raking up creeping stems of weeds before mowing helps with their control. Remove wormcasts when they appear: Worm casts should never be ignored. When squashed underfoot the surface is rendered uneven and the bare earth makes an ideal seed bed for weeds. When casts appear scatter them with a besom or stiff broom before mowing and removing the clippings using a grass box. Using a treatment such as Castclear can help prevent wormcasts without harming the worms. Kill weeds and moss when they appear: Don't wait until the problem gets out of hand. Occasional weeds can be pulled out - occasional patches of moss indicate that the growing conditions have to be improved. Apply a weedkiller or moss killer promptly as soon as there is an obvious invasion. Aerate the lawn: The lawn is aerated by driving a fork or other spiked instrument at intervals so as to relieve compaction - drainage is improved and new growth is stimulated. Aerate at least once a year if the ground is badly compacted and moss is present. Top dress the lawn: Top dressing is the application of a bulky mixture, usually made up of peat, loam and sand. This dressing should be ap[plied every autumn, and it is an essential technique if you want a really first rate lawn. The vigour of the grass is improved and minor hollows are removed. Feed with a balanced fertiliser in autumn: Autumn feeding to build up the root system and increase disease resistance is a useful procedure. Ensure that you choose a treatment that is intended for autumn use. Hopefully the above will be of use to you but should you require any help with your lawn please do not hesitate to get in touch.